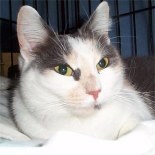 TRINITY WAS ADOPTED APRIL 6, 2003! She is happy owning the room, and we open the door and let Kai see her thru the gate. He whines, and she does not run away though she stays a respectful distance. This weekend we will supervise a visit if Mishka wants to come out. She sits at the window sometimes, and likes her new cat bed and scratch-board. Quite fastidious in the litter box, too. She is sweetly affectionate with all of us. Really a lovely little girl. Hoping Kai and she will get on eventually. Jordon and Trinity had been found as strays almost one year ago. They had spent the last year in a small cage in a shelter with only each other for company. They very well could be sisters and get along great with each other. 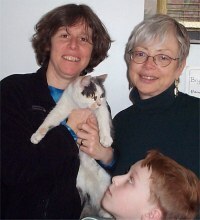 We would like for them to adopted together but will consider individual homes. They no longer need to live in a cage and have a whole basement to run around in at their foster home but it still isn't the real thing. They would really like to experience living in a real home. These girls are about 1 1/2 - 2 years old. They are nice and mellow and very affectionate. Their most favorite activity is being combed.